For the first time since the London 2012 Olympic and Paralympic Games the public will be able to make a splash in the same swimming pools as some of Great Britain’s greatest athletes. 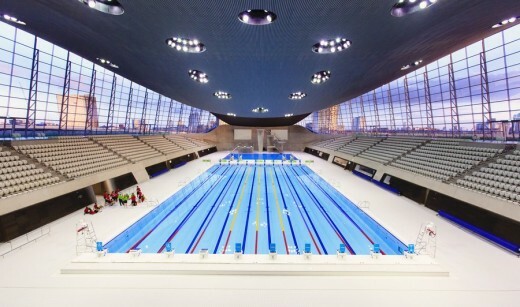 The iconic London Aquatics Centre at Queen Elizabeth Olympic Park opens its doors on Saturday 1 March 2014. Designed by internationally renowned architect, Zaha Hadid, the London Aquatics Centre is one of the most recognisable venues from the Games with its unique wave like roof. The venue houses two 50 metre swimming pools. The Games time competition pool will be available for lane and fitness swimming. 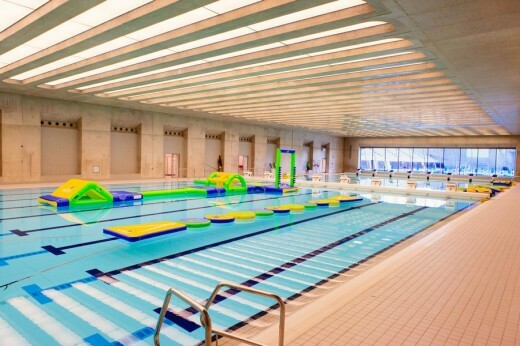 A 50 metre training pool will be available for family sessions, fun sessions with inflatables and swimming lessons. There is also a 25 metre diving pool with boards and platforms up to 10 metres, a dry diving zone, a state-of-the-art 50 station gym and café. From 1 March the venue, which is operated by Charitable Social Enterprise, GLL, will play host to a variety of activities. Swimming sessions will cost as little as £3.50, the same as a swim in any other local pool, there will be swimming and diving lessons, and inclusive community sessions. The venue also has an innovative lift mechanism called a ‘Poolpod’ for people who require mobility assistance. In addition to community swimming, the Aquatics Centre will host a range of national and international events including the FINA/NVC 2014 World Diving Series in April, the 2016 European Swimming Championships and is the new home of British Diving. Dennis Hone, Chief Executive London Legacy Development Corporation said: “This is an exciting moment in the legacy of the Games. The iconic London Aquatics Centre with its unique design will now be open for the public to enjoy. We promised the former Olympic and Paralympic venues would have long-term legacy use and we have delivered. Now local communities and visitors alike can come and swim in this amazing new venue. Since the end of the Games, transformation work has been ongoing at the London Aquatics Centre. The temporary seating stands, which held 17,500 seats, were removed and 2,800m² of glass and eight doors were installed allowing natural light to filter into the pool. The London Aquatics Centre is at the entrance to the south of Queen Elizabeth Olympic Park where, from 5 April 2014, visitors will be able to enjoy beautiful parklands and waterways, arts and events and spectacular views from the ArcelorMittal Orbit. More than a million visitors have already enjoyed the north of the Park and Copper Box Arena since they opened in July 2013. Visitors can experience four types of Olympic cycling in one place for the first time in the world at Lee Valley VeloPark from 31 March and in May 2014 Lee Valley Hockey and Tennis Centre will open for both community and elite use. Work is underway to transform the Stadium in to a multi-use venue. It will be the permanent home of West Ham United Football Club from 2016 and the new national competition stadium for athletics in the UK. The venue will host five matches as part of the Rugby World Cup 2015 and the 2017 IAAF World Championships and 2017 IPC World Athletics Championships. • The building is 45m high. • The aluminium roof has 50 per cent recycled content. • The Aquatics Centre uses 32 per cent less potable (drinking) water compared to other pools. This is achieved by using low flow fittings and recycling water. • There are 628 panes of glass in the new windows. Two enormous cranes removed the final elements of the temporary seating stands on Wednesday morning (22 May), revealing the original Zaha Hadid designed building at long last. The final trusses which formed the spine of the temporary seating stands on either side of the Aquatics Centre were removed today as part of the work to transform the former Olympic site into Queen Elizabeth Olympic Park. Each truss weighed 172 tonnes and required two cranes weighing 800 tonnes and 750 tonnes to lift and lower the pieces to the ground. “The former Olympic Park is being transformed in to a fantastic new public park. The £292million project to adapt the Park and take down the temporary venues, like the Aquatics Centre seating, is running on time and on budget. We will open the first part of the Park this summer with a series of events in the north of the Park and the Copper Box opening to the public. The rest of the Park will open in phases through to spring 2014 when the Aquatics Centre will open and people will be able to swim in those fantastic Olympic-sized pools.” Balfour Beatty is working on the transformation of the Aquatics Centre, now the two seating stands have been removed work has started to install 3,000m² of glass along the sides of the Aquatics Centre allowing lots of natural light into the pool. When the Aquatics Centre opens in spring 2014 it will have a cafe and crèche, a dry dive training area and a full programme of aquatics activities from lane swimming and lessons to aqua-aerobics, water polo and synchronised swimming. The Aquatics Centre will be operated by GLL on a 10 year lease. GLL is a London-based social enterprise which means that surpluses it makes are reinvested into sport and local communities. GLL is working with British Swimming to locate an elite swimming and diving programme in the Centre alongside community use. Going for a swim in the Aquatics Centre will be affordable, when the pool opens the price of a swim in the Olympic pools will be the same as a swim in a local leisure centre – currently around £4.30. Around 800,000 people are expected to make use of the Aquatics Centre from 2014. The Aquatics Centre will continue to host major swimming competitions, London has bid for the 2016 European Swimming Championships and the 2014 FINA Diving Championships which it hopes to host in the Aquatics Centre. Since taking control of the Park in November 2012, the Legacy Corporation has been undertaking a huge programme of work to transform the site and its iconic venues ready for public use. The £292m construction programme, one of the largest in Europe, is on track to deliver Queen Elizabeth Olympic Park – a new part of London to live, work, visit and invest. The Park will soon begin to re-open in phases as works reach completion, starting with the official opening of North Park in July 2013. This will include the Copper Box, London’s third largest arena at 2,743m2 (equivalent to 12 badminton courts), and the Unity Kitchen Café at Timber Lodge, a new community space with a stunning new playground and open spaces for visitors to walk, play and enjoy. Over the past six months, the Legacy Corporation has been getting its programme ‘Clear, Connect, Complete’ well underway to transform the Park from the Olympic event site to a new part of London. The programme is clearing Games-time overlay including temporary venues, walkways and stands, connecting the Park to the surrounding area with new roads and pathways and completing the Park’s venues and parkland to their legacy designs, ready to open its doors in full in spring 2014. Just as the Games were delivered across 10 years from bid to closing ceremony, the delivery of legacy is a 10 year programme and the works underway now will deliver a lasting legacy for east London. Construction on the Park has already brought over a thousand jobs to the area, 44 per cent of workers are from the local area and there are 60 apprentices on site – the highest number on any London site. In just a few months, the first families will also begin moving into 2,818 homes, including 1,379 affordable homes on the site of the Athletes’ Village, to be known as East Village. Chobham Academy will also open this September, with a further three schools planned to be built on the Park over the coming years. The Legacy Corporation is celebrating the phased re-opening of the Park from July 2013 to spring 2014 with a programme of summer entertainment and events, bringing world-class sport and international artists back to the iconic venues. The summer line up will give local residents and visitors an opportunity to experience what the park will have to offer when it opens in full in spring 2014. • The roof’s unique design means it sits on only three concrete supports – two northern supports and a southern wall. Some ticket holders for Olympic diving will have obstructed views. The 600 seats in question only concern 10-metre platform events. Small portions of the dives may not be visible. The Aquatics Centre features a dipping roof that limits viewing from the highest seats. Organizers say they will refund any ticket holders unhappy with the obstructed views, either before or after the events. Zaha Hadid has denied her design for the London 2012 Aquatics Centre is to blame for the obstructed viewlines. The Olympics Aquatics Centre obstructed view tickets cost between 30 and 50 pounds ($46-$77). Those seated at the top of the Olympics Aquatics Centre temporary seating wings will have to watch dives from the ten-metre platform on large screens. Around 2400 seats were not put on sale because of restricted views. 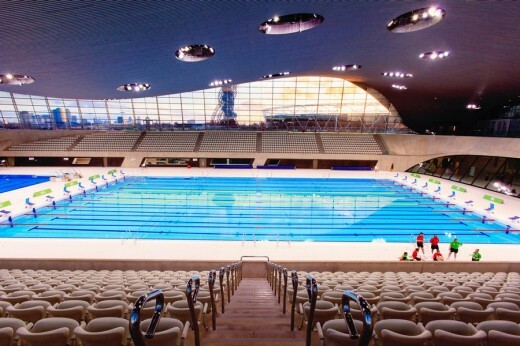 The Aquatics Centre is designed with an inherent flexibility to accommodate 17,500 spectators for the London 2012 Games in ‘Olympic’ mode while also providing the optimum spectator capacity of 2000 for use in ‘Legacy’ mode after the Games. The Aquatics Centre is within the Olympic Park Masterplan. Positioned on the south eastern edge of the Olympic Park with direct proximity to Stratford, a new pedestrian access to the Olympic Park via the east-west bridge (called the Stratford City Bridge) passes directly over the Centre as a primary gateway to the Park. Several smaller pedestrian bridges will also connect the site to the Olympic Park over the existing canal. The Aquatic Centre addresses the main public spaces implicit within the Olympic Park and Stratford City planning strategies: the east-west connection of the Stratford City Bridge and the continuation of the Olympic Park along the canal. The Aquatics Centre is planned on an orthogonal axis that is perpendicular to the Stratford City Bridge. All three pools are aligned on this axis. The training pool is located under the bridge with the competition and diving pools located within the large pool hall enclosed by the roof. The overall strategy is to frame the base of the pool hall as a podium connected to the Stratford City Bridge. This podium element contains of a variety of differentiated and cellular programmes within a single architectural volume which is seen to be completely assimilated with the bridge. The podium emerges from the bridge to cascade around the pool hall to the lower level of the canal. The pool hall is expressed above the podium by a large roof which arches along the same axis as the pools. Its form is generated by the sightlines of the 17,500 spectators in its Olympic mode. Double-curvature geometry has been used to generate a parabolic arch structure that creates the unique characteristics of the roof. The roof undulates to differentiate between the volumes of competition pool and the diving pool. Projecting beyond the pool hall envelope, the roof extends to the external areas and to the main entrance on the bridge that will be the primary access in Legacy mode. Structurally, the roof is grounded at 3 primary positions with the opening between the roof and podium used for the additional spectator seating in Olympic mode, then in-filled with a glass façade in Legacy mode.